Results from Eastbourne Magistrates’ Court, sitting at Hastings, for August 21 - August 29. Thomas Thomas, 46, of Ridgewood Road, Bexhill, pleaded guilty to driving a Nissan Note vehicle on the A27 at Berwick, on October 17, last year, with no insurance. He was fined £113 and his driving record endorsed with six penalty points. Jay Greenley, 42, of Roselands Avenue, Eastbourne, pleaded guilty to driving a vehicle on the A267 at Horam on August 1 while twice over the drink drive limit. He gave a breath alcohol reading of 70 micrograms. The legal limit is 35 micrograms. He was fined £369 and banned from driving for 18 months. George Huggett, 18, of Upper Chyngton Gardens, Seaford, pleaded guilty to assault by beating. The offence took place at Priory Road, Eaastbourne, on July 21. The court made a community order. Robert Henderson, 42, of St Matthews Gardens, St Leonards, pleaded guilty to assaulting a woman. The offence took place at Hailsham on April 4. He also pleaded guilty to being in charge of a black Staffordshire pit cross breed dog which was dangerously out of control. The offence took place at Hailsham on the same date. The court issued a restraining order and ordered him to pay £200 compensation and £750 in court costs. He was fined £150 for the dog offence. The court ordered the dog to be muzzled at all times in public and kept of a secure lead and not be walked or exercised near any educational premises and that the rear garden needs to have adequate, secure fencing, no less than six feet high, or risk being destroyed. Jake Spencer, 24, of Royal Parade, Eastbourne, pleaded guilty to two charges of using threatening behaviour. The offences took place at Royal Sussex Crescent, Estbourne on July 8 and July 15. He was given a one year conditional discharge. Dillon Beeching, 18, of Jevington Gardens, Eastbourne, pleaded guilty to assaulting a woman by beating her. The offence took place at Seaford Road, Crawley, on May 23. He also pleaded guilty to damaging an internal wall and mobile phone, belonging to the victim, at Crawley on the same date. The court made a community order with a requirement of 80 hours of unpaid work. Magistrates also issued a restraining order. Timothy Coombes, 44, of no fixed address, was found guilty of two charges of assaulting a woman by beating her. The offences took place at Hailsham on February 13 and 23. Sentencing was adjourned until September 21 to tie in with other cases. He was remanded in custody. Joey Hedges, 24, of Angelsey Avenue, Hailsham, pleaded guilty to assaulting a woman by beating her. The offence took place at Diplocks Way, Hailsham, on May 3. The court made a community order with a requirement of 80 hours of unpaid work. Magistrates also issued a restraining order and ordered him to pay £150 in prosecution costs. Mark Hoare, 38, of Downline Close, Horam, pleaded guilty to assaulting a woman by beating her. The offence took place at Ashford Square, Eastbourne, on July 3. He also pleaded guilty to two further charges of assault by beating at Eastbourne on the same date. The court made a community order with an alcohol treatment requirement and a requirement for 100 hours of unpaid work. 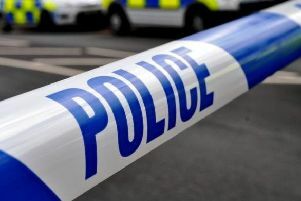 Dennis Jackson, 52, of Langney Rise, Eastbourne, was found guilty of entering a property at Reynolds Road, Eastbourne, on July 20, while under the influence of alcohol when prohibited from doing so by a court restraining order. He admitted being in breach of a suspended sentence, made by Lewes Crown Court on June 26 for an offence of harassment. He was committed to Lewes Crown Court for sentencing on September 25 and remanded in custody. Arthur Holscher-Ermet, 24, of West Hill Road, Bournemouth, Dorset, indicated a plea of guilty to being in possession of a quantity of cannabis. The offence took place at Eastbourne on March 17. He was detained in the courthouse for a period and ordered to pay £85 costs. Michael Jones, 47, of no fixed address, pleaded guilty to using threatening behaviour and to assaulting a police officer. The offences took place at Terminus Road, Eastbourne, on July 28. He was sentenced to 28 days in prison, suspended for one year. Magistrates said the reason for the sentence was ‘extreme behaviour, aggravated by previous offences. Robert Thompson, 47, of Faygate Road, Eastbourne, was found guilty of assault by beating. The offence took place at Court Road, Eastbourne, on February 3. Sentencing was adjourned until September 21, for pre-sentence reports to be prepared. He was released on conditional bail. Robert House, 21, of Londonderry, Northern Ireland, pleaded guilty to driving a Renault Clio on Blackwater Road, Eastbourne, on August 13, while over the drink drive limit. He gave a breath alcohol reading of 59 micrograms. The legal limit is 35 micrograms. He was fined £80 and banned from driving for one year. Lucas Lamb, 35, of Alexandra Road, Eastbourne, pleaded guilty to two charges of using threatening behaviour. The offences took place at College Road, Eastbourne, on August 8 and 9. The court made a community order. He was fined £40 and ordered to pay £50 in compensation.